A few weeks ago I read a delightful book, Bran Hambric: The Farfield Curse. This is the first title in what promises to be a thrilling new series by Kaleb Nation, a young author who I believe is going to make a big splash on the children's literature scene. You can view my review of the book here on the TTLG website. Thanks to Kaleb's publisher, Sourcebooks, I was able to interview this exciting new author. Marya: Where did the idea for this book come from? Kaleb: I was up late on the night of March 3, 2003, and had a sudden idea of Bran and Sewey on their rooftop, waiting for a burglar -- exactly how Chapter 1 opens. There were many other ideas attached to the image, and questions that I had to answer. By answering those questions, I slowly formed the story. Marya: Bran Hambric lives in a city where many people are closed minded and unwilling to consider that mages and gnomes can be perfectly nice people. Are you trying to make point here? Kaleb: When I set Dunce as a city that banned gnomes and magic, I was trying to create the image of a people who are not intrinsically bad, but are blinded by their prejudice. They would never even try to meet a gnome or a mage, because if they did, it would shatter their prejudice, which in turn would shatter their entire identity. When someone becomes so wrapped up in hatred for people they have never met, they usually end up looking as foolish as the Duncelanders! Marya: You have some wonderful made up names in the story. How did you come up with these? Kaleb: Some of the names come from myths and legends. Balder is the name of a Norse god. I invented Sewey when I was very young and heard someone say something about Chop Suey in a movie. A lot of the names were used in old stories I was writing years before The Farfield Curse, so it's hard to remember their sources! Marya: What is your writing process? Did you plan the story in advance, or did it evolve as you wrote it? Kaleb: I wrote the book in a somewhat odd way! For the first book, I did not plan out much, and just wrote an entire 500-or-so page novel in about seven months. I then rewrote the entire book multiple times, until I got tired of all the plot issues, and only then plotted out chapters on paper. However, for the sequel I'm writing now, everything is plotted out, so I don't get stuck as easily (or take six years to write it!). Marya: Did you read fantasy books when you were growing up? If so, which ones did you like? Kaleb: I did read some. I enjoyed the Chronicles Of Narnia and The Lord Of The Rings especially. Marya: I know you have plans for more Bran Hambric books. Do you have plans for other books as well? Kaleb: I certainly hope to write more than Bran Hambric. I have ideas for another series afterwards that are still brewing. I've also been working off and on with another story that is not a fantasy, and is very different from everything I've done before. It's one of those stories I think will take a decade to write the way I want, so I'm not looking to see it in stores anytime soon! Marya: Do you know what is going to happen to Bran in the next book? Bran: I know what's going to happen to Bran in all the books! I know who he meets, when he meets them, and who dies, and who lives. I know exactly how even the last book is going to end. For me, it is just the journey of getting there. As a child, Kaleb Nation had to be forced by his mother to write one page a week in creative writing. But by the time he finished his first story, no one could make him to stop. Age twelve, Kaleb promptly telephoned the senior editor of a major publisher to pitch the book…and got to talk with security instead. But as with most writers, not even that could stifle his dream. On the third night of the third month in 2003, age 14, Kaleb had a sudden idea that began the story of Bran Hambric, a novel which would take most of his teenage years to write. In early 2007, Kaleb finished the first book in his series (Bran Hambric: The Farfield Curse) and signed with Richard Curtis Associates, a leading New York literary agency. In 2008, Kaleb’s debut novel was sold to Sourcebooks, one of the largest independent publishers in the nation, for a Fall 2009 release. Aside from writing, Kaleb hosted his first radio show in Texas at age 13, later launching his own program in 2006 called The Top 5. Originally produced exclusively for KalebNation.com, Kaleb’s show eventually grew to be broadcast on AM, FM, Internet, and satellite radio stations across the globe, making him one of the youngest nationally syndicated hosts on the air. Kaleb was also heard daily as the lead voice-over on WZDG-FM in North Carolina. In mid-2008, Kaleb launched a second blog at TwilightGuy.com, giving chapter-by-chapter insight, from a guy and writer’s perspective, on reading the Twilight Saga, a series of popular novels. The website went on to receive over 3 million hits in its first 9 months online, and was featured in BusinessWeek and Entertainment Weekly magazines. Kaleb also began posting regular videos on his Youtube channel, with a combined total of over 3 million plays. In his free time, Kaleb enjoys creating music and blogging at kalebnation.com. A homeschool graduate and a former black belt in taekwondo, he currently attends college in Texas and turned 20 in 2008. This morning I was listening to the radio, and I heard about how people from all over the country are going to pay their respects to the late Senator Edward Kennedy. Many of people stood in lines for hours outside the Kennedy Library in Boston to say goodbye to a man who worked so hard to help the American people. Many of the visitors were astonished when family members came out to shake their hands and to thank them for being there. This gesture touched many hearts and it reminded me that the Kennedys were, and are, a very special family. We know about John, Robert, and Edward and their service to the country in the political arena, but many of us don't know that the Kennedy's have also given the world of children's literature some wonderful books. Caroline Kennedy gave us A Family of Poems: My favorite poetry. 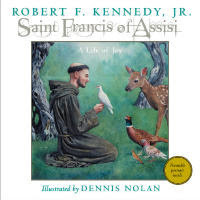 Robert F. Kennedy Junior wrote Saint Francis of Assisi: A life of Joy, Robert F. Kennedy, Jr.'s American Heroes: Robert Smalls, the Boat Thief , and more recently Robert F. Kennedy Jr.'s American Heroes: The Story of Joshua Chamberlain and the American Civil War. Maria Shriver has also written several books for children including What's wrong with Timmy? In 2006 Edward Kennedy wrote a children's book, My Senator and Me: A dog's eye view of Washington, D.C. I will be reviewing this latter title very soon. I hope you get the opportunity to take a look at some of these books. Caroline Kennedy's collection of poems is especially wonderful. It is a book that readers of all ages will enjoy. A blast that shook the world. On August 26th, 1883, a small island in the Sunda Strait between Java and Sumatra blew up. The explosion was heard up to 5,000 kilometers away and the dust from the eruption affected sunsets in far away New England. Not long ago I read and reviewed a fantastic book about this event. Here is the review. When the volcano on the island of Krakatoa blew itself apart on August 26th, 1883, it had a global effect. Not only was the world’s climate affected for months to come, and not only did thousands of people die, but for the first time in human history a catastrophic event was no longer a local happening. Thanks to the telegraph machine, within hours of the eruptions people in the Netherlands knew what had occurred. Scientists and others were able to make the connection between the events in the Sunda Strait and the strange sunsets that were being seen all over the world. People who owned barographs - instruments that measure atmospheric pressure – were able to figure out that a shock wave from the eruption and gone around the world no less than seven times. The explosion on the tiny little non-descript island had brought the people of the world together and the world quite suddenly seemed to become a much smaller place. Scientists have now figured out that Krakatoa had a long history of violent eruptions. The explosion which took place in 1888 was not an isolated event and the people in the area had plenty of warnings that something big was going to happen. Indeed weeks before the big eruption tourists from the town of Batavia (Jakarta) went to take a look at the smoking mountain, and some foolhardy souls even climbed the main cone to look into the crater. After the 1888 eruption was over, all was quiet in that area for a while. And then, in 1927, volcanic activity began anew. By 1930 a small island that was half a mile long and twenty feet high could be seen. This island was named Anak Krakatau (son of Krakatau) and by 2000 it had grown to the height of 1,500 feet above sea level. The island is still growing and it is active on a regular basis. 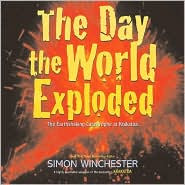 In this fascinating and superbly presented book renowned author, Simon Winchester, not only tells the story of one of the world’s most astonishing natural disasters, but he also explains why volcanoes form; he gives an account of the history of the Sunda Strait area; and he explains what the impact of the volcano’s eruption was on the world as a whole. The writing is interesting, punchy, and highly entertaining, and readers will come to appreciate how powerful volcanism can be. With numerous illustrations, diagrams, maps, and photographs, this book will delight anyone who has an interest in this subject. Every so often I come across a book that I think has universal appeal. Readers of all ages will get something from it as they read the story and, in this case, look at the pictures. This morning I reviewed just such a book. It is called All the world. Here is my review. Many of us spend our lives running from place to place, and from activity to activity. We rarely take the time to appreciate the now, to enjoy what we are doing right this minute. In this beautifully written and illustrated picture book, Liz Garton Scanlon and Marla Frazee have created a memorable text and lovely illustrations to tell the story of one day in the life of a family. As the day unfolds, we are reminded of the wonderful things that fill out lives, the simple pleasures that make life so special. 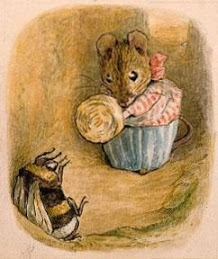 The book begins with two children playing on a beach. The build a sandcastle, dig a moat, and take “a shell to keep.” Then the family heads to a farmer’s market where they buy produce and flowers. There are moments that are trying, for example when a storm arrives and rain pours down, and there are moments when everything is right with the world. This book celebrates the connections between people, the wonders that fill our world, the high points that we share, and the low points that we also share. It is a title that readers of all ages will enjoy. If you like books that give you pause, that evoke memories of your own, and that are a joy to read and to look at, then this is a book for you. Enjoy! Eighty-nine years ago today the 19th Amendment to the U.S. Constitution was ratified giving American women the vote. It was a long battle for women to get the vote, and the women who began the fight in 1848 at Seneca Falls, NY did not get to see the fruits of their labors. It was their daughters and granddaughters who were finally able to cast their votes in national elections. The Ninteenth Amendment came into law on on August 26th, 1848, which is now celebrated as Women's Equality Day. "Women were meant to be an ornament to man, and to comfort him after his labours." This is what Susan Elizabeth's Papa thinks. Her mother however has very different ideas, thinking that "woman are in chains" and that it is the duty of every enlightened woman to go out and battle for the rights of all women. 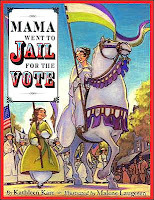 In short Susan Elizabeth's mother is a suffragist and every day that she can she joins other women demonstrating against the oppression of women. Of course for Susan Elizabeth this is all hard to understand until her mother explains to her how women in America have no say in how their country is run. Susan Elizabeth starts to get interested in her mother's cause and wants to help and so she does, in her own small way. When Susan Elizabeth's mother spends months picketing outside the White House in all weathers, Susan Elizabeth begins to think that President Wilson needs new glasses for he does not seem to see the women and their signs. Then, one dreadful day Susan Elizabeth's mother is arrested and Susan Elizabeth's life gets infinitely more confusing. Being a plucky and determined young lady Susan Elizabeth takes matters into her own hands. Isn't she after all one of the soldiers in her "Mama's Army?" The "war" that Susan Elizabeth and her mother take on is superbly portrayed in this picture book which captures the essence of the struggle that the women's rights "soldiers" faced. An interesting "Historical Note" in the back of the book provides further information about the women's rights movement. You can read a brief history of the women's rights movement here. When I was still quite young, I learned two things about my father that astonished me. One was that he was born in 1919. I had no idea that my father was "so old!". He certainly did not look it. The other was that he had served in the Indian Airforce, and had done his part to fight the Japanese during World War II. I even got to look at his war medals. My father told me a few stories about his war experiences, and one that I will not forget was his account of the surrender that he witnessed on August 15th ,1945. For him, and so many other men fighting in the war, it seemed as if the Japanese would never give up. The relief he felt on this important day was enormous. At last he could go back home and resume his life. At last he could leave death and conflict behind. While I was growing up, on August 15th, my family would get together with our closest friends to celebrate Indian Independence Day and V-J Day (Victory Over Japan Day). Many people also call this day Victory in the Pacific Day or V-P Day. For some years I did not celebrate the day, because I was in college and then trying to find jobs. Then, after I got married, I started celebrating August 15th with my own family. This year my mother is visiting us (my father is no longer with us) and we will be hanging out the Indian flag and remembering my father's stories about his war. I, of course, have a personal reason for having an interest in War War II, but I do think everyone benefits when they learn about events that took place in the past. Learning about history and about the people who affected history helps us to better understand our world. It helps us to appreciate what we have, and the sacrifices of our forebears. My dear father gave up his scholarly life as a professor to serve his country, and I am enormously proud of him for doing so. Over the years I have put together a large collection of book reviews about World War II books. I hope this feature will help you to find books for your children that will make it easier for them to better understand this war. I recently looked at some wonderful eBooks that Sylvan Dell has put on their website. The publishing house has upgraded their ebooks to make them better than ever. Here is a little information about the books. Do take a look, and make use of the free trial. MT PLEASANT, SC - Sylvan Dell Publishing went LIVE in July with its next generation eBook, proving the company represents “so much more than a picture book;” it represents a full-fledged campaign for literacy in America. 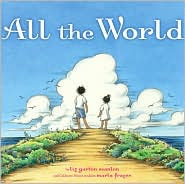 founding in 2004, co-founders Lee and Donna German have been ahead of the picture book publishing curve. Last year, Sylvan Dell awarded free eBook site licenses to over 2600 elementary and Title I/III schools nationwide through their School Resource Grant Program. On this day in 1945 an atomic bomb was dropped on the Japanese city of Hiroshima. No matter what you think about the use of the bomb, there can be no doubt that this event changed the lives of millions of people. Not only did thousands of Japanese men, women, and children die, but the rest of us have had to live with the fear of nuclear war ever since. The story of what took place in Hiroshima, and later in Nagasaki, is a grim and painful one. Many of us would prefer that our children not know about what happened on that day. But, as my daughter told me a few years ago, "I want to know, so I can remember those people." Now my daughter and I light a candle on August 6th every year, to remember. I have also shared several children's books with her that describe what took place on that terrible day and why. You can find my reviews of these books on the Atomic Bomb feature page. Though all the books in the feature are excellent, I found Laurence Yep's book, Hiroshima, to be particularly meaningful and moving. This year Elise and I are on the Hawaiian island of Maui on this 6th of August. We are going to light a candle as we always do, and we will remember. Labels: atomic bomb, Hiroshima, Laurence Yep, remembering. This week I am on a Hawaiin island, lazing on a beach with my family. Ahhh there is nothing quite like a day at the beach. Sun, waves, sand between your toes, snorkling, the smell of sunscreen, the taste of a nice cold fruity drink. There are some people, however, who hate the beach. Scaredy squirrel is one of these poor unfortunates. As far as Scaredy Squirrel is concerned, beaches are dangerous places. When I read this book I literally laughed out loud. If you have met Scaredy before you will love this new adventure. If you haven't, then you are in for a treat. 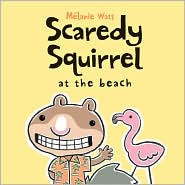 Here is my review of Scaredy Squirrel at the Beach by Melanie Watt. Scaredy Squirrel refuses to go to the beach. Beaches are, after all, dangerous places for a flying squirrel. There are seagulls that might mob you, tribes of jellyfish that might sting you, herds of sea monsters that might eat you, packs of pirates that might kidnap you, tons of falling coconuts that might knock you out cold, and mobs of lobsters that might pinch you. Wanting the beach experience without having to go to the beach, Scaredy begins to create a beach right there under his tree. After much preparation the beach is finally ready. Or at least it is almost ready. All that is missing is the sound of the surf. For this Scaredy is going to need a sea shell. And so Scaredy gets ready for a big expedition. As per usual the squirrel who is afraid of almost everything makes careful preparations before he leaves his home. With his passport in hand and taking every tool that he will ever need to combat lobsters, jellyfish, pirates, coconuts, sea monsters, and seagulls, Scaredy sets off for the beach, ready to face the unknown. In this deliciously funny book Scaredy the Squirrel once again takes a dramatic step. This time he goes to a place that scares him silly, and he makes a surprising discovery about beaches. With wonderful tough in cheek humor that will appeal to readers of all ages, this third book in the Scaredy Squirrel series is a book that will bring forth chuckles, giggles, and guffaws from its readers. Using humor and her wonderful illustrations, the author shows her readers that going beyond ones safe zone can be fun and enormously rewarding. Readers will love the ending that offers up one last delightful surprise. Readers might like to enhance their Scaredy Squirrel experience by visiting the Scaredy Squirrel’s website. You can read my reviews of the other Scaredy Squirrel books here.